As many Greek traditional cuisines, Santorini traditional cuisine features unique local dishes based on traditional local products of Santorini island. Those dishes and beverages are part of the economic life and cultural heritage of the island. For many centuries, they have gained an exceptional position in the tourist development of the island. 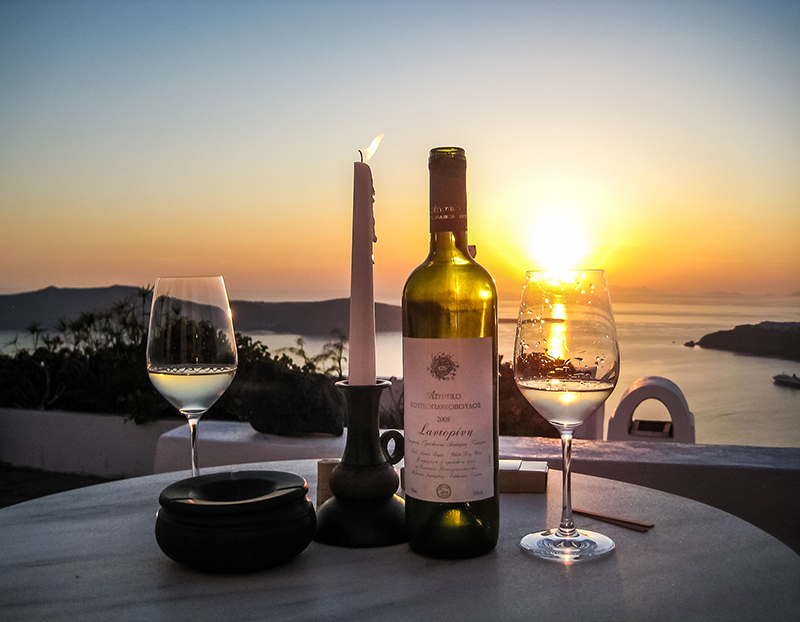 Santorini wines, especially, are a strong part of the local economy. They are exported around the world and have become popular for their quality and fine taste. Looking for accommodation in Santorini? Check out Luxury Holiday Villas in Santorini! Santorini in Cyclades is a real “temple” of unique tastes, made from high quality products. Book now your holidays in Santorini and get ready…. Most special flavors of Santorini traditional cuisine await you to taste them! Fáva is the most popular ingredient of Santorini traditional cuisine. As it is a real gift of nature to the island, it has been declared as a “protected destination of origin” product (P.D.O.). It is an ancient product of the earth of Santorini, with distinctive natural flavor. The Minoans used to taste fáva several thousand years ago. Today, we have the chance to enjoy its original taste on our plates. You may taste it in different culinary versions: boiled with a little bit of raw olive oil, as an appetizer· cooked with tomatoes, onions and capers· cooked with eggplants sauce and pork, as a normal meal. fáva soup ∙ fáva balls∙ fáva rice ∙ fáva in omelette. Fáva everywhere! The cherry tomatoes is another legendary ingredient of Santorini traditional cuisine. It is deep red, juicy and aromatic, thus is the king of the local traditional salad. In order to make this salad, you only need barley rusk, the rain-fed cucumber of Santorini, capers and goat cheese. The greatness of simplicity! You may also taste them in fried tomato balls. Equally exceptional are also the sweet white eggplants with their soft outer shell. The white aubergines can be used in multiple dishes of Mediterranean cuisine. So, if you spend your holidays in Santorini, it is worth trying it, either in a simple eggplant salad or in mousaka, with small round potatoes and zucchini that grow in the island. Summer is on your plate! As you are on a Cycladic island, you would probably want to taste some high quality fish food. So, visit the fishing areas of the island and taste its fresh fish treasures. A delicious idea, that we strongly recommend you is the local brantáda. Fluffy cod fillet dressed with crisp batter, served with a refined garlic sauce with eggplant. Other delicious fish dishes of Santοrini traditional cuisine are the smelt pies or “savori” fish, fried with vinegar and garlic. 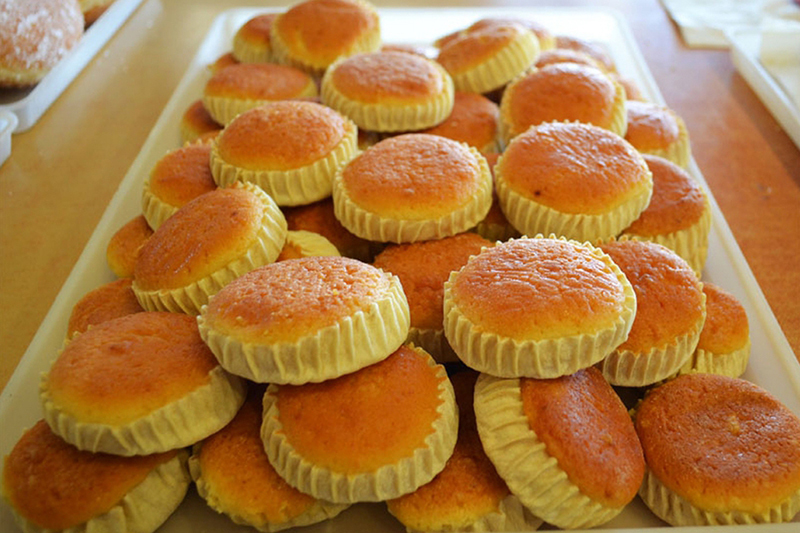 What better to end your meal, than the traditional sweets of Santorini? A really popular one is cherry tomatoes garnished with cinnamon and whole almonds. 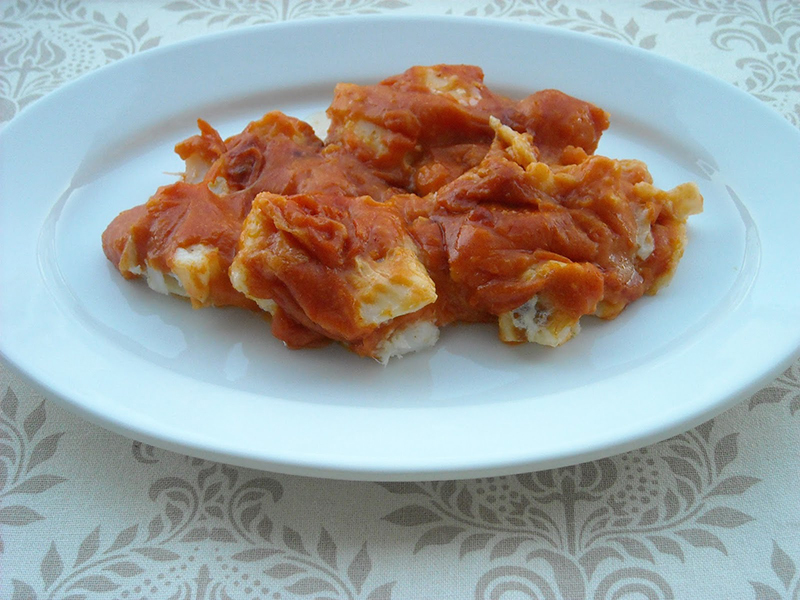 If you are lucky, you will also try “melitínia” – a traditional Easter dessert. In addition to the traditional desserts, you will try some really special ones, like tiramisu with grilled eggplant, almond praline and bitter orange sauce or kantaifi with amazing cottage cheese mousse! “Assyrtiko”, “Athiri”, “Aidani” “Mantilaria”, “Mavrotragano” are just some of the dozens of native varieties that thrive for centuries on the island, having their roots in volcanic soil. The peculiarity of the soil and the microclimate of the island combined with the effort of local producers to harness their land give high quality wines with solid structure, refreshing acidity, intense minerality and aromatic complexity. In the picturesque village of Pyrgos, you will find the winery of the agricultural association of Santorini. There, in its scenic balcony that seems to hover over the caldera, you will say goodbye to the sun with a glass of Vinsanto –the sweet “diamond” of Santorini vineyards- or a cool Assyrtiko. There are many wineries on the island. Tasting tours to production sites and vineyards, visits to museums and traditional “canavas” are some of the options that will give you an unforgettable experience. The delicious dishes of Santorini traditional cuisine combined with the exceptional varieties of Santorini wines and the breathtaking sceneries that the island offers, offer you a magic journey in all senses!